Sri Lankan Chicken Curry Sri Lanka is a foodie heaven. With influences from the Portuguese, Dutch, Arab traders, Southern India and British Colonists the cuisine is truly wonderful. So fragrant and light, with main ingredients being coconut, cinnamon, green chilli and lime. It is a magical country, from the white sands and warm turquoise seas (We recommend Mawella beach, very quiet except for the fishermen pulling in their catch every morning) to the rolling hills of the tea plantations around Ella. Nothing is more breath taking than hanging out the doorway in third class of the train that chugs through the mountains from Ella to Kandy, and far less terrifying than getting the bus (actually thought “that was it” about 12 times). We ate and ate and ate, one of the most unusual and exciting was a banana flower curry – had no idea you could eat banana blossom, and it was delicious. Had fantastic fish curries on the beach, fried doughnut balls with spring onions and chilli on the trains and hoppers for breakfast with fresh coconut sambol. This recipe was from the head chef at The Sun House in Galle, a beautiful boutique hotel just outside the old fort. Funnily enough it is where an ex Tart of ours Emily Dobbs learnt the tricks of the trade (now smashing it with her company Weligama – she makes the best hoppers we have ever had and we are waiting with baited breath for her cookbook to come out!) 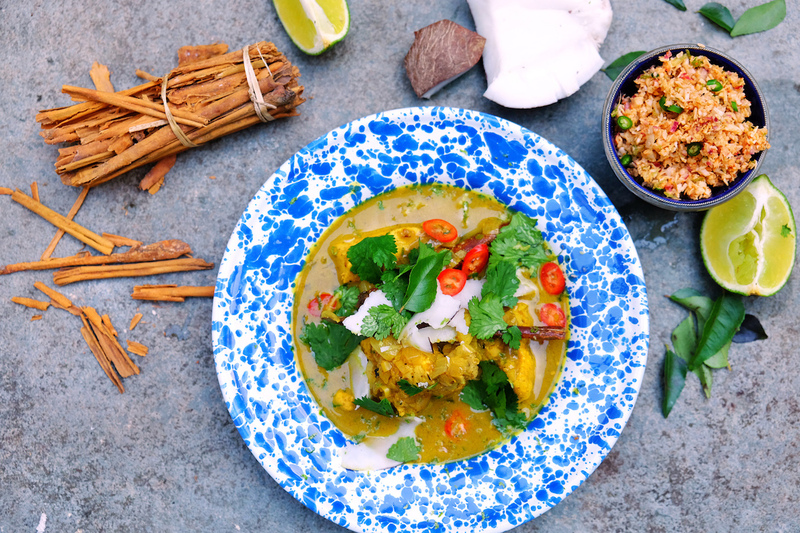 This recipe is for traditional Sri Lankan chicken curry, you could easily swap chicken for fish or vegetables as we found out while traveling around – the same base is used in numerous of different dishes, one of the best being a calamari curry that we had on the beach. After returning to London and deciding to give it a go we were nicely surprised to see that it tasted exactly the same (might be down to the fact that we were using all the Sri Lankan spices we had collected on our travels)! So without changing much here is the recipe, we are adding the coconut sambol – which is traditionally meant to go with eggs at breakfast but its so delicious we want to have it with everything. 1. Heat the coconut oil in a pan over a medium heat, add the curry leaves, onion, garlic. Chilli, ginger, lemon grass and sauté for about 5 minutes. 2. Add the fenugreek, cardamom, cinnamon and curry powder, cook for about 1 minute then add the chicken and coat in the spices – cook for 2 – 3 mins then add the vinegar and the coconut milk. Simmer for 10 – 15 mins and add the lime juice. Taste and season. Serve with rice.